"Recently, my older brother was here for a visit. He left a small piece of paper on my table at home, with the following words. I wanted to share it with you because it speaks with eloquence, and relevance to the Ponca people. In this hour of need, we owe it to our children to be warriors." Will not threaten the future of the People. 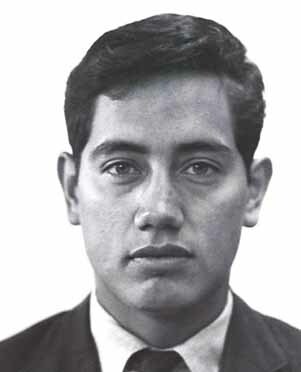 William "Bill" Pensoneau of the Collins and Pensoneau, Little Cook genes, son of Edward and Harriet Collins Pensoneau. Word was received, July 26, 2002 that Bill Pensoneau was hit and killed by a train in Minnesota. William Cecil "Bill" Pensoneau, former Ponca City resident, departed this life on Thursday, July 25, 2002, in St. Paul, Minn.
Bill was born Nov. 6, 1945, in Pawnee to Edward and Harriet Pensoneau, the third of eight children, and was the grandson of Elizabeth Littlecook and Narcisse Pensoneau and Bill Collins Sr. and Metha Collins. Bill attended St. Mary's Catholic School and Ponca City High School. He was an avid basketball player most of his life. Bill attended many institutions of higher learning, including Oklahoma University, Sacramento State and UCLA, ending his formal education with a masters degree from Harvard University. His career included professorships at Harvard University and UCLA. All who knew Bill were acquainted with a man of quick wit, intellect and good cheer. He was an educated man that never lost the "Common Touch." One of the many highlights of his life included a multi-year tour with the musical troupe "Up With People." This exciting time enabled Bill to travel to Europe, Asia, Russia and many other locales as one of the spokesmen for the troupe. Bill was preceded in death by his parents, Edward and Harriet Pensoneau, and two siblings, Edward, Jr. and Lila Vera. Bill is survived by his two children, Jennifer Cecily and husband, Jason Wolf and Migizi Pensoneau. Also, brothers, Steve Pensoneau and David Christopher Pensoneau; sisters, Charmain Billy, Darlene Harjo and Elizabeth Primeaux; and one aunt, Velma Jones of Ponca City. An evening prayer service will be held on Tuesday, July 30, 2002, at 7:30 p.m. in the Ponca Tribal Cultural Center. The funeral will be held at 10 a.m. on Wednesday, July 31, 2002, with the Rev. Francine Big Goose, assisted by Minister Toby A. Blackstar, Otoe Baptist Church of Red Rock, officiating. Burial will follow in the Ponca Tribal Cemetery under direction of Grace Memorial Chapel. The traditional funeral feast and give-a-way will be held at 1 p.m. at the Ponca Tribal Cultural Center. Casket bearers will be Dustin Cook, Douglas Pensoneau, William Clyde Pensoneau, Jon Primeaux, Johnson Taylor Jr. and Billy Wilson. Honorary casket bearers will be Mick Billy, Kennis Headman, Dan (Sasuweh) Jones, Rayburn LeClair, Charlie Moncooyeh and Johnson Taylor Sr. Flower bearers will be Jacqueline Billy, Sheila Clay, Francine Mendoza, Elizabeth "Cooki" Pensoneau, Jennifer Primeaux, Vivian Whitebull and Sonya Youker. Because your genius stood, you had to pay. If there was anyone tall and handsome it was you. Brilliance was covered by a quietness. Only seeing at a distance, your star. Your lovely writing came to us from sister. You left it on the table for her when you left and missed her. Who knows the mind we lost because of these imperfect worlds. If we were robots we could survive the tumultuous swirls. Not today, not this way, just on we must flow. You truly had risen above the rubbish. Understanding resurrection one day, see you, coming over the hill.